I heard a great quote recently: “On the other side of complexity lies simplicity”. Being in the right work situation is complex. I have spent the majority of my professional career, researching, writing, speaking, coaching and working in the real world with real people. Much of my time has been spent on the question about how to find and define the elements that make work great. I want to share three simple thoughts that help us to arrive in this place of daily contentment. 1. We need to be doing interesting work that aligns with who we are. 2. We need to be working for a leader we admire, respect and who calls out our very best. 3. We need to be rewarded in a way that supports the kind of life we desire. It is this very simple mix of elements that will help your align yourself with work that is a fit for you. The complexity lies in delving through these 3 components as an individual, not through a formula like the Myers Briggs work type. You are complex, your career options are also complex and work should feel challenging and satisfying. There is simplicity on the other side of the working through these important three principles. P.S. Looking to identify the right career for you? The Career Identity Program is a 1-1 customizable program to help identify & narrow down practical answers to that complex question. Read client success stories here! P.S. Join our next free weekly 45 Minute CareerClass webinar, “Find the Right Career Right Now!” on Wednesday June 27 from 12 to 1 pm. 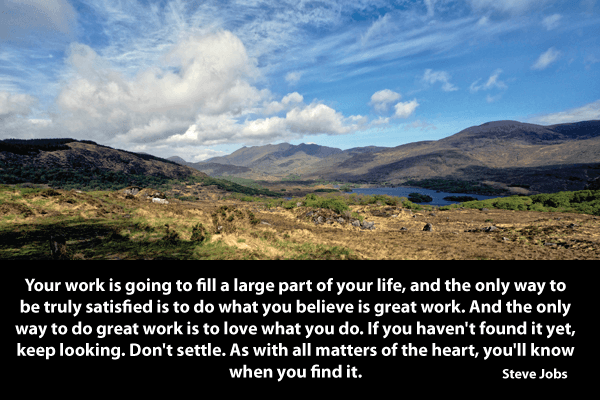 We’ll be talking about finding and keeping passion in your work life. Learn along with others – most are in a similar life situation, asking the same questions and facing the same challenges.